Rodent masks with 15 mm adapter. The masks for mice, rats, guinea pigs and small birds are constructed from the plastic syringe holders of large disposable syringes. A plastic ring holds a latex rubber diaphragm in place on the body of the mask. When the rubber material is in place and fastened by the plastic ring, a scalpel or scissors is used to make a hole and remove excess material. 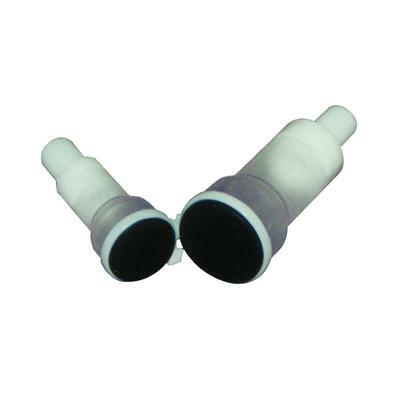 The masks with the 15 mm adapter can be used with a Bain circuit, nonrebreathing system or Y piece. 1-1/16" diameter.